Are you a victim of domestic violence and need time off from work in order to obtain medical treatment, relocate your residence or make a court appearance? Is your employer threatening your job because you missed some time from work as a result of being a victim of a sexually violent offense? Do you need to take off from work because your child or parent sustained physical or psychological injuries caused by an incident of domestic violence or sexual violence? 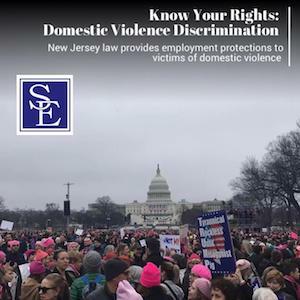 If so, there are New Jersey and federal laws that may provide you with the job protection that you need to address the domestic violence or sexually violent offense circumstances. New Jersey enacted the New Jersey Security and Financial Empowerment Act (the “SAFE Act”) to provide qualifying employees up to twenty (20) days of unpaid leave from work. The SAFE Act provides 20 days of unpaid leave to those who have been a victim of domestic violence or sexual assault, or, whose child, parent, spouse, civil union partner, or domestic partner was a victim. The SAFE Act applies to both public and private employers who employ 25 or more employees. In order to qualify for the job protections provided under the SAFE Act, an employee must have worked at least 1,000 hours in the preceding 12 months. The employee must be a victim of domestic violence (as defined by N.J.S.A 2C:-25-19) or a sexually violent offense as defined by N.J.S.A. 30:4-27.6). An employee can also exercise their right to the protected leave if their child, parent, spouse, domestic partner or civil union partner is the victim of domestic violence or a sexually violence offense. attending, participating in, or preparing for criminal or civil court proceedings as a result of the incident of domestic violence or sexual violence. Does the SAFE Act prohibit employers from retaliating against employees who exercise their rights under the law? Yes. The SAFE Act has an anti-retaliation provision which makes it illegal to take or threaten to take reprisals such as discharging, harassing, discriminating or retaliating against an employee in connection with the compensation, terms, conditions or privileges of employment because the employee took or requested any leave that the employee was entitled to under the SAFE Act. How does the NJ SAFE Act coordinate with other leave laws such as FMLA or NJFLA, and other Paid Time Off? In addition, the protections provided under the SAFE Act, an employee who falls victim to domestic violence or sexual assault may also be eligible for protected leave from work under the federal Family and Medical Leave Act (FMLA) or the New Jersey Law Against Discrimination (LAD). In order to qualify under the Family and Medical Leave (FMLA), the employee must have been employed by the employer for at least (12) months and worked at least 1,250 hours during the last year preceding the leave. The employer must also have 50 or more employees. The leave must be needed as a result of the employee suffering a serious health condition as a result of the domestic violence or sexual assault. If the employee does not meet all these requirements, he or she could also be eligible for a reasonable accommodation under the New Jersey Law Against Discrimination (LAD) if the employee is suffering from a disability as a result of the domestic violence or sexual violence. A reasonable accommodation could include a medical leave of absence. Whether the need for medical leave of absence needs to be provided by the employer will depend on the reasonableness of the request. If providing the medical leave would cause the employer the suffer an undue hardship to their business operations, the requested accommodation would be considered unreasonable and the employer would therefore not have to provide the employee the protected medical leave. There are not bright line rules to determine whether an accommodation is reasonable and the determination is made on a case by case basis. Protected leave may also be available under the New Jersey Family Leave Act (NJFLA) if the leave is needed to provide care to a family member who falls victim to domestic violence or sexual assault. In order to qualify under the New Jersey Family Leave Act (NJFLA), the employee must have been employed by the employer for at least (12) months and worked at least 1,000 hours during the last of the preceding year. The employer must also have 50 or more employees. The leave must be needed as a result of the employee’s family member suffering a serious health condition as a result of the domestic violence or sexual assault. If an employee requests a leave for a reason covered by the NJ SAFE Act and the New Jersey Family Leave Act (NJFLA), or the federal Family and Medical Leave Act (FMLA) the leave will count simultaneously against the employee’s entitlement under each corresponding law. An employer may require an employee to use accrued paid vacation leave, personal leave, or medical or sick leave during any part of the 20-day period of protected leave. If you have questions about your SAFE Act rights, please contact us to schedule a consultation with one of our FMLA New Jersey Employment lawyers who protect the rights of victims of domestic violence or sexual violence.